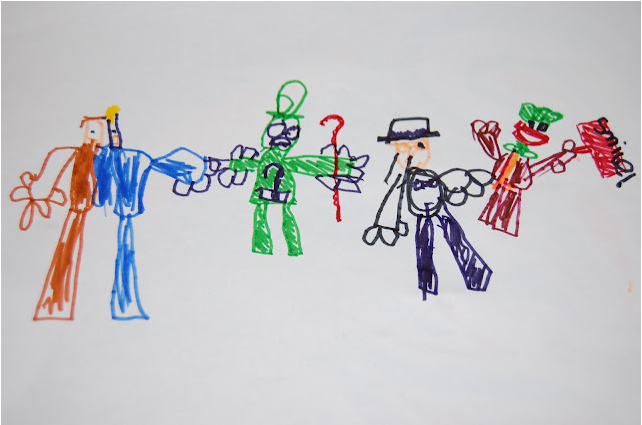 Gifts from the Pirates: "There's a magical place, were on our way there"
This is definitely one of our most watched things on the TV which is great because we are no longer subjected to episode after episode of Ben 10 (Thankfully that phase passed pretty quick). Its always great as a child when you see a great film or series that there is a toy range to back it up even if it is not directly based on it. The Imaginext range does just that. After buying Seth the Batcave a while back we have slowly been building our collection based solely on good behavior which luckily for him he has a never ending amount of. Today was no different, Seth had been exceptionally good with watching and playing with his little brother and impecable manners so off to Toys R us we went. "Today we went to Toys R Us and on the way there i was hoping that we could buy the Batboat when we got there we went straight to the batman aisle. We looked for the Batboat but it wasn't there, so instead we looked for all the things that i don't have already. I was allowed a new toy because i have been a good boy, it made me happy. There was a Batcopter and a submarine there but i decided to get the superman figure that came with his dog and some krypt...something, oh i cant remember. Kryptonite (Seth proceeded to repeat Kryptonite about 10 times in different ways). We had a look round the rest of the shop and found some batman gloves and mask. I'm going to try and be very good so that i can ask Mommy, Pauly or the pirates for them. I like looking at the batman Lego to see what minifigures they have to go with the Jokers funhouse that pauly built for me. He made me a Mr Freeze figure out of my minifigures and it was pretty funny because it didn't have a proper head it just had a see through Lego bit that was round." Well Superman met the gang and fit in very well (Seth was happy at the extra good guy as he has lots of villains and they keep taking over the batcave so the caped crusader could do with the extra help). The great thing about the DC Imaginext range is the variety, there are a great selection of different characters and vehicles. which has been great for educating the boys on the characters backgrounds etc. Also you know that you can safely leave your children to play with these toys as they are made by Fisher Price (which is great for the many worrying parents out there). The range is really well made too which you expect from Fisher Price. There's nothing worse than children's toys that fall apart and it can be very upsetting for them. 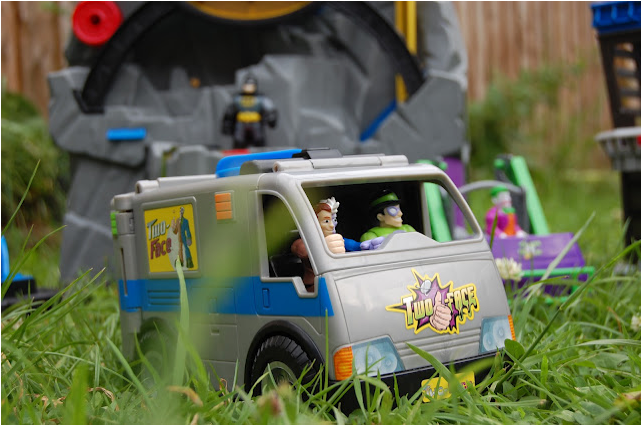 Toys R Us has been great for getting hold of the sets although Ive been a little disappointed that they haven't had the Jokers Fun House in as me and the boys really want to get hold of it. 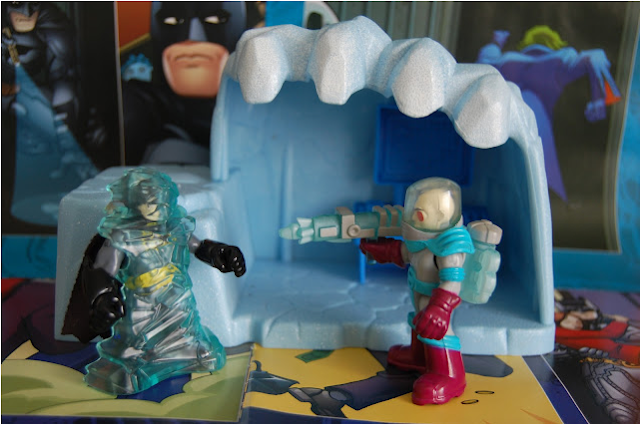 I wrote recently about the Two Face van and Mr Freeze Ice cave also purchased from our local Toys R Us during their 3 for 2 range which i took full advantage of. I find that Toys R Us tend to have much better offers on than any of our other local toy shops, and the staff are always really helpful. Ive got some great memories of my parents taking me to the Oldbury store in Birmingham so Toys R Us has always been special to me and I'm glad i can now share it with my boys. Plus i once had a Christmas temp job at the branch in Chester when i was younger, it was only for 2 months but i was in my element surrounded by toys. Its not changed that much over the years too with Geoffrey popping up on the adverts. One of the things that Seth really likes about these toys is that they go with Opeies Batman little people range, the colours used are the same on both collections which is great. They put their Batcave's together and it's really sweet. Seth also likes playing with them as he thinks their little fat bellies are cute. 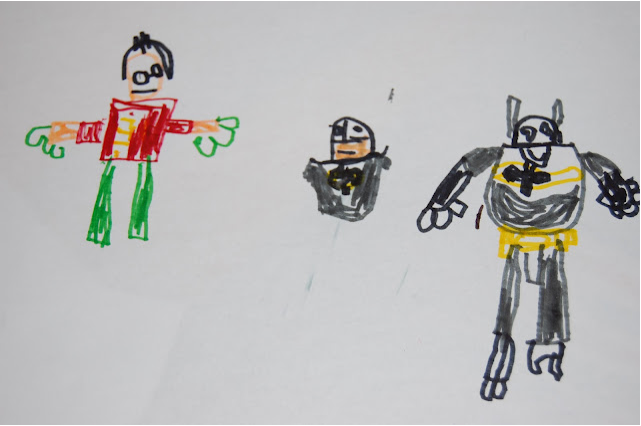 I think its great that Fisher Price have released the batman ranges to appeal to 2 different age brackets and has worked out really well for us with Opeie, he doesn't feel left out when Seth is playing as he has the same characters. Anything that can get the boys playing together is great with us but they do love playing Batman together its so sweet to watch. If your as passionate about your toys as we are or if you just love seeing that excited look on your child's face then Toys R Us is definitely the place to go, even if we don't find what were looking for we never come out of there empty handed and we are never disappointed, "There's toys in their millions, all under one roof". It's called Toys r us , toys r us, toys r us!!!! I remember going there as a child- I bought a Cabbage Patch Kid! Oooh must take the boys there soon... Thanks for adding this to the blog... I think you have such a good way of describing things when it comes to toys! Thanks! I love Seth's shorts, where are they from? Thanks for dropping By Jan, the shorts are from Sports direct. they are very sturdy, I recommend starting with the Batcave! It's the best way to build a collection.... I think the Jail set is very good value too! We dance when the advert comes on! Mrs M always says her mom used to get her CP Kids! They are alittle odd looking! What a lovely message Joanna , watch this space for more Toys R us finds and reviews! We LOVE it! wow hi, of course i remember you. how are you and the little one doing? i hand so many of my cards out,its so nice to hear the people i give them to are actually reading the blog. Did you start writing one as you did mention you were thinking about it. Ive brought a couple of the batman lego sets recently and would be happy to write a post about them including some others. 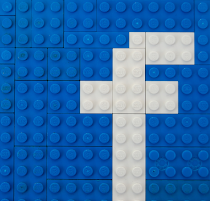 Lego is great to get into and fun to do together we sit some days for hours building.